ENGLEWOOD, Colo., July 20, 2018 /PRNewswire/ -- Customers can now start a conversation with DISH the same way they would text message friends and family. 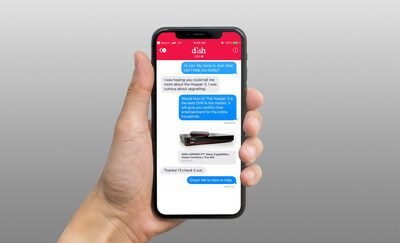 DISH today joined Apple Business Chat, enabling customers to chat directly with live customer service representatives through Messages on their iPhone and iPad. "TV should be simple, so we've made reaching our live customer service representatives as easy as sending a text," said John Swieringa, DISH chief operating officer. "Adding messaging with Apple Business Chat is a powerful way to connect with us, giving another choice so you can pick what fits with your life." "We're here on your time, so send us a message as you head out to work and check back later," added Swieringa. "We know you're juggling ten things, so we'll keep the thread open for you." Customers can leave a conversation with DISH at any time and pick it back up when convenient, even on another Apple device linked to the user's Apple ID. The conversation never times out and ends when a customer deletes the message thread in the Messages app. Last year, DISH confronted the pay-TV industry's historically low customer satisfaction with "Tuned In To You," a DISH TV promise to listen to and fight for customers. DISH is ranked number one in Customer Service nationally by J.D. Power and our customers.